Property Details: 2 BR, 2 BA Gulf-front Home with more than 1100 sq. 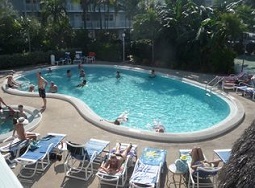 ft.
La Brisa condo, beachfront resort home in Key West. Beautiful resort residence completely upgraded including flooring, Tommy Bahama sleeper-sofa, hot water tank, clothes washer, code door-lock system, dining table/chairs, bar-stools, entertainment center, lighting & lamps, ceiling fan, hardware in bathrooms, window treatments, outdoor lounge chairs, etc. The kitchen has granite counter-tops and stainless steel appliances. Additional storage closet just outside the condo in the hallway. Great real estate investment or 2ndhome, being sold completely furnished and includes a designated covered parking space. Community amenities include indoor & outdoor pools, game-room, hot-tub, boardwalk to the beach, exercise facility, outdoor BBQ grills, etc. Seller is an Alabama licensed real estate agent…don’t miss viewing this home at La Brisa Condos in Key West, FL. Time passes slowly in the Florida Keys, everything in Key West has at its' own pace, including the ice melting in your margarita glass. Key West, the southernmost island of the Florida Keys, is known as the “Winter White House” because of its appeal to visiting U.S. presidents, and the island has been home to literary greats like Ernest Hemingway and Tennessee Williams. The diving in Key West is incredible, as are kid-friendly activities like the Florida Keys Eco-Discovery Center. Key West, approximately roughly 90 miles north of island of Cuba, is known for conch-style houses and is popular port-of-call for cruise ships - Key West is known for its coral reefs and as a destinations for diving and snorkeling – not to mentioned live entertainment, shopping, fresh seafood, etc....all in a Caribbean paradise.